A plant based bamboo toothbrush for Adults. The handle is made from certified 100% organic bamboo. The soft bristles are made from a base of 62% castor bean oil (Certified bio-based). The wrapper around the toothbrush is plant-based and home compostable. BPA-Free, Vegan, and Verified Non-toxic. This bamboo toothbrush has a biodegradable handle made from certified 100% organic bamboo (certified by CERES of Germany). The soft bristles are made from a base of 62% castor bean oil (Certified bio-based).The wrapper around the toothbrush is plant-based and home compostable. BPA-Free, Vegan, and Verified Non-toxic. - Soft bristles are made from a base of 62% castor bean oil (bio-based and recyclable, but not biodegradable). - The handle is made from 100% bamboo (organic and wild - no pesticides or fertilizers). - The wrapper around the toothbrush is plant-based and commercially compostable. - The box encasing the toothbrush is made from paper - no tape or glue is used. - Your bamboo toothbrushes can be used for just as long as plastic toothbrushes. - USDA Certified Biobased. Green American Certified. Vegan. BPA-Free. Natural and Non-toxic. 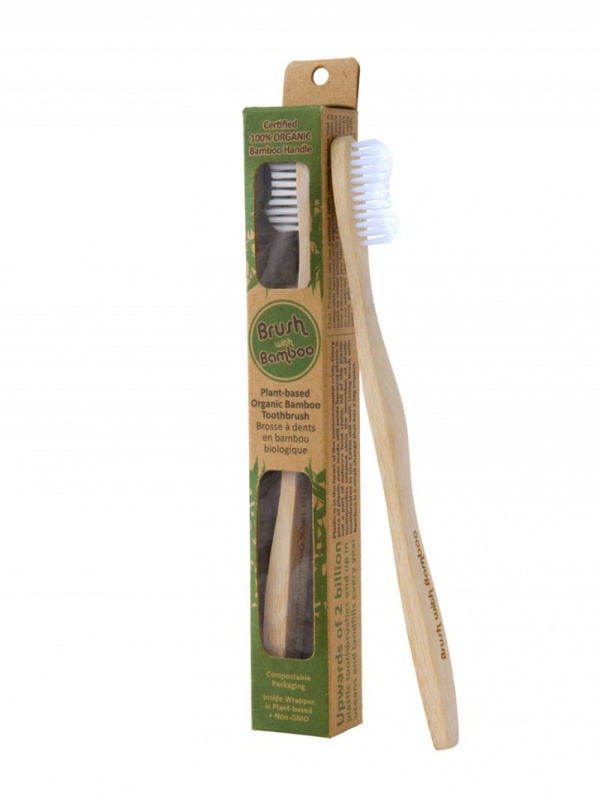 A purchase of this toothbrush is a vote for biobased products that are not fossil fuel-based! A high quality easy-to-grip curved handle made entirely out of bamboo. Only organic, wild, giant Chinese Moso Bamboo is used for the bamboo toothbrush handle. No pesticides or fertilizers are ever used on this bamboo - in fact, because it is wild mountain bamboo, doing so would be completely impossible. Likewise, this bamboo is never watered by humans - only natural mountain rain. At present Brush With Bamboo are harvesting less than 1% of the possible bamboo resources available in the sprawling Chinese bamboo mountain range where this bamboo is harvested. Less plastic, more bamboo! This special SOFT bristle is composed of 62% Castor Bean Oil, 38% plastic. This is the latest and most advanced biobased bristle in the world today. It's biobased, but still not biodegradable. You may have seen Dasani brand plastic water bottles made form 30% plants - these bristles are a similar concept. Brush With Bamboo are pushing bristle manufacturers to develop better alternatives to nylon. This new bristle that we are now using is the best available option. It's not perfect, but it's a step in the right direction. Bamboo is the fastest growing plant on earth. Because it contains naturally-occurring antimicrobial agents, there is no need for using fertilizers or pesticides during its cultivation. This bamboo is totally organic and wild. After it is harvest another stalk takes its place and grows to full size within just 2 years - a remarkable growth rate! Store Your Brush in Dry Area. Bamboo is a natural material that keeps best when kept in a dry area. Enclosed toothbrush cups that collect water are not ideal. It's best to keep your toothbrush in an open-air toothbrush holder or any other dry area. The different parts of the toothbrush can be disassembled for proper disposal. The bristles are not biodegradable but could be recyclable in your city. Contact your city about the best way to recycle bristles. Using pliers, it is easy to remove the bristles from the head. Doing so will also remove a small metal staple that is used to clamp the bristles to the handle. The handle can be reused or disposed of in a commercial composting bin. The bare toothbrush handle can be disposed of in a commercial composting bin and will safely return to the soil within 6 months. However, the handle is a perfectly good piece of high quality bamboo - feel free to reuse it! The wrapper on your toothbrush is compostable in city and commercial facilities only. Do not place it in your home compost pile. The outer box is also biodegradable and made from 100% recycled paper. You may find some creative reuses for the box. Dispose of the box in a recycling or green waste bin.